The State Bar of Texas was the first bar association in the United States to create a separate division for paralegals. The Paralegal Division of the State Bar of Texas (the “Division”) was created on October 23, 1981, and has been in existence for 29 years. In honor of the many contributions made by the paralegal community and the Paralegal Division, the Senate of the State of Texas adopted Proclamation No. 1144, recognizing October 23rd as Texas Paralegal Day. Please join in the celebration of Texas Paralegal Day on October 23, 2010. 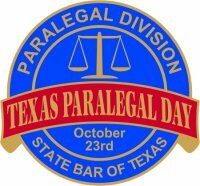 Texas Paralegal Day celebrations are taking place across the state! Events will be posted alphabetically by city; more details will be added as they become available. Additional Information: There will very special guest speaker and the Paralegal of the Year Award will be announced. Additional Information: Cost is $25.00 per person. Come and join us celebrate this special day. Our guest speaker will be Evelyn Lord. Also, the Paralegal of the Year will be elected and the fall scholarships will be awarded. Additional Information: Cash bar and heavy hors d’oeuvres will be provided. Sponsor will provide free goodies to all attendees. Come and learn about the benefits and opportunities offered by joining the Division. Come mingle and have a good time! Sponsoring Organization: Paralegal Division – D12, Denton County Paralegal Association (DCPA) and Joseph F. Zellmer, P.C. Additional Information: Come, have fun and join us celebrate Paralegal Day. Our sponsors have graciously provided the food and drinks free of charge. Additional Information: Join the PD for a day of CLE and celebration. Earn 4.5 hours of CLE from speakers including the Honorable J. Wade Birdwell of the 342nd Judicial District Court. Event is free of charge and includes a luncheon. Registration required; submit to Michele Rayburn by 10/22/10. This entry was posted on October 20, 2010 at 3:13 pm	and is filed under Paralegal Day, Uncategorized. You can follow any responses to this entry through the RSS 2.0 feed. Both comments and pings are currently closed.